SummitPresentsAwardatPortlandChamberEvent - Summit Utilities Inc.
PORTLAND, Maine – On September 23, Summit Natural Gas of Maine presented the Neal W. Allen Award for Leadership in the Public Sector to Bill Shane, town manager in Cumberland, Nathan Poore, town manager in Falmouth and Nat Tupper, town manager in Yarmouth for their exceptional leadership and vision to bring natural gas to the three towns. The ceremony took place at the 160th Annual Community Leadership Awards hosted by the Portland Regional Chamber of Commerce at the State Theatre in Portland. The 160th annual awards event showcased the growth of local businesses for the regional chamber of more than 1,300 members. Nominees for the Neal W. Allen Award nominees must be either appointed or elected officials of state, county, regional or local government and have, through their public careers, made a significant contribution to the future of greater Portland. Preference is given to projects or activities which are of a regional nature. This year the Chamber recognized three municipalities, Cumberland, Falmouth and Yarmouth, for their outstanding leadership working together as a single region to provide their communities access to natural gas. “Along with the Chamber, we are proud to present this prestigious award to the three town managers. Their leadership and vision to bring natural gas to Cumberland, Falmouth and Yarmouth was extraordinary. With miles of pipeline already in the ground, we are excited to continue our efforts to bring a safe, more affordable energy source to businesses and residents in the three communities,” said Minkos. The award is named after Neal W. Allen who was born in Portland and was a longtime history professor and colonial law scholar. Before returning to Maine in 1981 and serving as president of the Maine Historical Society, Allen taught history at Union College in Schenectady, New York for 30 years. 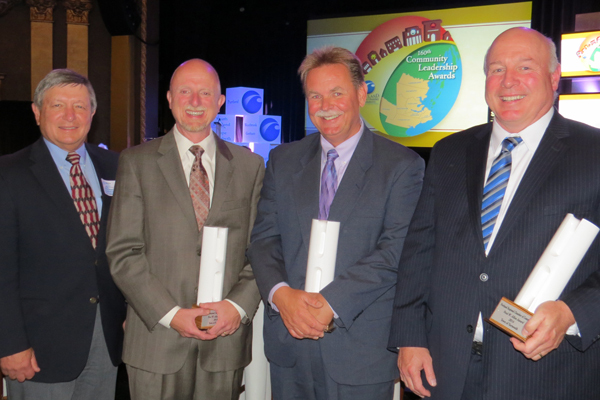 The award was presented by Mike Minkos, president of Summit Natural Gas of Maine to the three town managers. The company plans to make an investment in the three towns of approximately $42 million, creating an estimated 200 jobs, and plans to serve about 8,000 residential, commercial and industrial customers during the next five years. During the past year, the company has signed more than 1,000 contracts with residents and businesses in Cumberland, Falmouth and Yarmouth that are prepared to switch to natural gas service. The Augusta-based company continues to install distribution lines throughout several communities in Cumberland, Falmouth and Yarmouth as well as in the Kennebec Valley and communities in central Maine. In 2014, Summit Natural Gas of Maine has plans to install more than 100 miles of natural gas pipelines to service areas in Maine, more than any other gas company.